Cahaba River Society works to restore the River by advocating for clean water, biodiversity, green infrastructure, and natural flows. Restoring the health of the Cahaba River watershed means doing what is best for all life that depends on it. What damages your Cahaba River? Urban growth can strengthen communities, but damage the river. Replacing forests with paving increases stormwater runoff, erosion, pollution, and flooding, and also prevents groundwater recharge, which reduces water in the river during drought. These are the top threats to our drinking water and to life in the River. These photos were taken at the intersection of the Cahaba River and Grants Mill Road in Irondale. From left to right, these images show the Cahaba after a rain, on a good day, and during the 2016 drought. pollution and the algae and oxygen depletion it causes, ended chicken waste dumping, and improved requirements for city/county construction sediment and erosion control. We are especially grateful to Southern Environmental Law Center (SELC), our major partner in these successes. Improved water quality standards for the Cahaba and other water bodies statewide. Prevented bad actors from polluting the River with fracking fluids and salts. Compelled Jefferson County to clean up sewage overflows in the River and countywide. Today we continue to monitor the County’s modernization of sewer infrastructure and management. Ensured that the state adopted an official target to reduce nutrients that choke the River with algae and oxygen-depletion and cut back nutrient pollution from sewage treatment plants. Ended GoldKist’s chicken waste dumping, which halved the River’s point-source nutrient pollution and let Girl Scouts safely enjoy the River at Camp Coleman again. Led the campaign that improved stormwater permits and codes of cities and counties to curb urban runoff damage from new development. 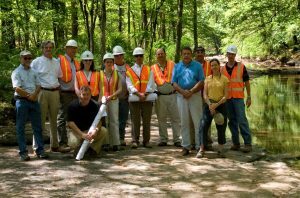 Cahaba River Society works collaboratively with governments, businesses, and civic groups to improve how development projects are designed and built. Green Infrastructure stormwater design is essential. Photo by Hunter Nichols. Cahaba River Society works collaboratively with governments, businesses, and civic groups to improve how development projects are designed and built. Green infrastructure stormwater design is essential. Cahaba River Society is the leading environmental nonprofit expert working with local governments and developers to improve stormwater design for new development. We promote green infrastructure, practices like rain gardens and pervious paving that reduce urban runoff and address the top threats to drinking water and biodiversity. In 2018, Cahaba River Society won a major success to improve management of urban runoff, the top threat to our drinking water and the River’s freshwater life! Because of our work leading environmental partners, cities and counties in the upper watershed have adopted improved stormwater codes and practices for new development, towards achieving the state’s official goals to reduce stormwater pollution–mud, nutrients, and human disease pathogens. Because Cahaba River Society has developed relationships as a trusted expert resource for city leaders, in 2018 we were able to work closely in just 6 weeks with Vestavia Hills, Mountain Brook, Homewood, Irondale, and Trussville to greatly improve their stormwater codes.